Using the ExecuteSQL method of the DotNetNuke Data Access Layer allows you to quickly and easily create DotNetNuke modules that access the database. I love stored procedures as much as the next developer and have used them for years. 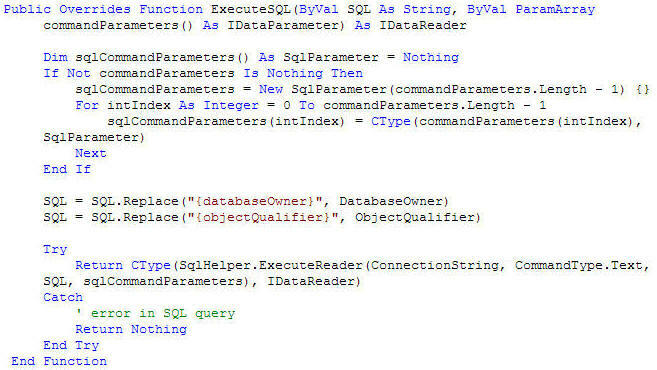 However, during development I use the ExecuteSQL method of the DAL+ to initially create the module and later I turn the SQL statements into stored procedures. Even if you decide to use stored procedures, the ExecuteSQL method will allow you to quickly create your module because you wont have to create the stored procedures until the final step. When you do create the stored procedures, you will be able to cut and paste most of the code. If you decide to use the ExecuteSQL statements in production, you will only need database scripts to create and alter your tables. If you use ANSI compatible SQL syntax your module should also work with alternate databases such as Oracle and MySQL. ExecuteNonQuery - Used to execute a stored procedure that will not return a value. ExecuteReader - Used to execute a stored procedure that will return multiple records. ExecuteScalar - Used to execute a stored procedure that will return a single value. ExecuteSQL - Used to execute a sql statement.